As with all Ministry albums released under a Democratic presidency, it's impossible to avoid that they simply aren't as good as those released under a Republican one. Al seems to turn his attention inwards when he has no political target to rail against, and these albums often seeming self-obsessed and meandering. That's not to say that they aren't good - I personally enjoy the sludgy and depressing Filth Pig a great deal. But few would claim them to be Ministry at their best. Now, Relapse is different, not being a perfect album, having self-indulgent waffle to a certain intent, but it does continue in the same vein of the band's winning streak up to The Last Sucker, echoing those tight and heavy metallic anthems. Take opening seven-minute stomper Ghouldiggers as an example, which is enjoyable enough despite being a rather self-obsessed rant from Al about how awful the music business is, complete with a mid-point skit in which he tries to ring his manager and gets put on hold. Yet the riffs surrounding it are tight and crunching enough to make you forgive it, and the following Double Tap is good enough to erase its memory, a blasting thrasher about Bin Laden's assassination. The album is pretty much up and down from then on, with just about more up than down. Freefall's drug despair is enjoyably crunchy, despite the juddering start, but Kleptocracy suffers from a poor chorus and one too many voiceovers, not being saved by a nice bit of soloing. 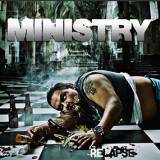 SOD cover United Forces stomps along enjoyably, whilst 99 Percenters is catchy but a bit too melodic for what you'd expect from Ministry. The title track is decent, if overlong, and although finale Bloodlust and the bonus remix of the title track are worth having, they're nothing to write home about. That sums the album up, really. Hardly Ministry at their best, but good enough for fans to bother with... There's little of the desperate passion which gave previous Ministry records their particular stunning impact, although Get Up Get Out N' Vote comes close. Yet in terms of politically inflammatory material, this is far closer to the concerns of left-leaning metalheads than the much vaguer revolutionary desires of Soulfly, Arch Enemy and so on, and even for someone who only agrees with Al J on occassion, this stuff is still blood-stirring, even when buried beneath whining about drugs. I'm glad someone's writing songs praising Occupy, however daft that chorus of "1-2-3-4-5-6-7-8-99 Percenters!" is, just so metal retains some connection to the real world. Of course, Al's ongoing health problems (including collapsing at a recent concert) mean that he should probably lay the band to rest for good, Relapse being something of a comeback effort... but this is clearly in his blood, and I expect him to be still raging from his deathbed. Which, given how above-par Relapse is despite its problems, is hopefully a long way away.